Create a place where you gather with family and friends, a place for quiet conversation on sultry summer nights. The Classic Massey Treadle Swing has a unique glider design so natural that you can swing for hours. Pick up a book, grab your laptop or just sit down with your favorite beverage and let the motion of the swing do the rest. Available in 4 foot and 5 foot wide designs, the Classic Massey Treadle Swing offers an escape after a long day. 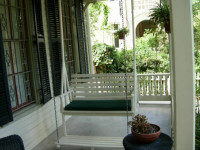 Swings n Such will custom design the swing for your porch and install the swing within 50 miles of Austin, Texas. Choose your color of paint or stain to best accent your home. This treadle porch swing was built from the pattern of the original swing, built in 1910 by my Grandfather Albert Massey. You will enjoy your yard and garden so much more from the comfort of a Classic Massey Treadle Swing and Arbor. 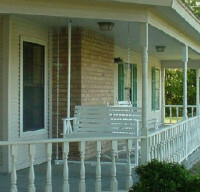 Bring the soothing motion of a porch swing to any part of your property. If you have a pool, you'll love this swing and arbor. 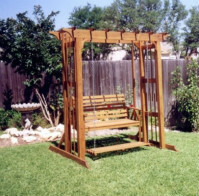 Handmade from treated wood, this swing is durable, even in the harshest sun. Don't let summer pass. Find out how to get your Classic Massey Treadle Swing and Arbor installed. We're happy to answer any questions you have. 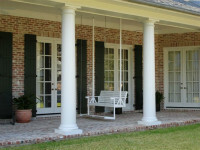 Please complete the following form for more information on our unique porch swings. For delivery outside of Central Texas, please tell us your ZIP code. Click on the arrow below for slideshow.